LOS ANGELES, CA (January 25, 2013) – Star Trek fans should get their transporter rooms ready to beam into a new universe of Star Trek television series and classic movies collectibles. 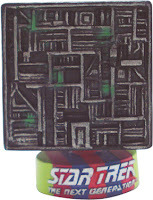 Bif Bang Pow!, under a license from CBS Consumer Products, will produce Star Trek bobble heads. Star Trek TV and film buffs around the world can start to collect a full armada of standard scale and miniature sized Monitor Mate™ bobble heads beginning Summer 2013. 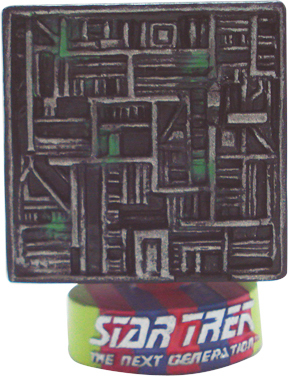 Kicking off the line will be an introductory sneak-preview limited edition collectible, a Toy Fair Exclusive Borg Cube Monitor Mate™, exclusively available for buyers who make an appointment to meet with our representative group, EE Distribution, at the Bif Bang Pow! booth #4950, New York Toy Fair, February 10-13, 2013. (Limit one per company per appointment, while supplies last. Additional rules apply.) Current EE Distribution clients should contact their representative to schedule an appointment. Others should call EE Distribution at 1-818-255-0090 x147 or email sales@eedistribution.com to make an appointment. "For close to 50 years, the characters of the Star Trek universe have taken us where no one has gone before, and now Bif Bang Pow! will be transporting all-new collectibles into homes and offices all over the world," said Jason Lenzi, CEO of Bif Bang Pow!. "We couldn't be more excited for fans to seek out what we have planned for the final frontier!" ™ & © 2013 CBS Studios Inc. STAR TREK and related marks are trademarks of CBS Studios Inc. All Rights Reserved. Bif Bang Pow!™ (bifbangpow.com) produces first-rate collectibles for such popular properties as Star Trek™, Doctor Who™, Dexter®, The Six Million Dollar Man™, Battlestar Galactica™, Californication™, The Venture Bros.™, NCIS™, Eastbound & Down®, and The Twilight Zone™. Founder Jason Lenzi is a seasoned television producer and the ultimate fan of cultish pop culture. So when he created his company in 2005, he took the fan's perspective. His idea was to bring items to the marketplace that he himself would want to own. Cultivated from TV, movies, books, comics, music, and more, Bif Bang Pow!’s mission is to provide high-quality action figures, toys, and collectibles to the massive cult audience (and kids of all ages) that wishes these toys were already in their collection.